Qawra is a town in Malta. It is located on the northeast of the Malta Island, and with Bugibba it forms a part of St. Paul's Bay. It is popular among tourists and is home to a many hotels and restaurants. Although there is no beach, many people swim and bathe off the rocks, which provide ample space for sun bathing. It is popular with tourists who like to walk by the sea at night. Qawra is also the site of one of the many towers built by the Knights of St. John. Qawra Tower is now a restaurant. The town is home to many water-sport activities including banana boat rides and speed boat rides. Qawra is also home to some great nightclubs and bars. This seaside resort is just 17.60km away from Valletta, which is the capital city of Malta. The parochial church of Qawra is dedicated to St Francis of Assisi. The parish incorporates both Qawra and the neighbouring locality of Bugibba in its geographical area. The parish feast is celebrated on the 17th of September which commemorates the impression of the stigmata on St Francis. The church in Qawra started operating as a parish on the 8th of December, 2004 and the first parish priest was Fr Gorg Zammit, OFM conv. The architect of the church building was Richard England. 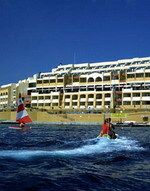 The Bella Vista Hotel Malta is located at St.Paul's Bay. The hotel commands a beautiful breath taking view of the green valleys and country fields in Malta where Qawra Bay is on one side and Wardija Hill on the other. It is in a prominent position on the Qawra Coast Road and very close to the centre of Bugibba, Qawra and St.Paul's Bay. The hotel has 150 rooms with balconies or terrace, which are of high standard and are equipped with satellite TV, direct dial telephone as well as air-conditioning. 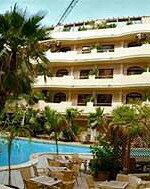 The hotel offers an indoor swimming pool, games room, sauna, jacuzzi, internet cafe, fitness room and multi purpose hall. Offering warm welcome and high standards of accommodation, this property is an ideal place for a comfortable stay. Situated just a few minutes away from the attractive Qawra promenade, Canifor Hotel is on the northern coastline of Malta. Surrounded by shops, restaurants, bars, pubs and a casino, this property is 17 kilometres from the airport. The property offers 150 comfortable guestrooms that are well-furnished and come with an array of modern amenities for a pleasant stay. At the onsite restaurant, guests can relish delicious Mediterranean cuisine in an informal atmosphere. After a tiring day, unwind at the cosy bar, which offers a variety of delectable cocktails with its live entertainment. The property offers well-appointed conference rooms for people travelling on business matters. During leisure, you can workout in the state-of-the-art gymnasium, have a bracing dip in the swimming pool, re-energise your body in the jacuzzi, pamper yourself at the sauna or indulge in your favourite game in the games room. Overlooking Saint Paul's Bay in Qawra and situated just 500 metres from the Water Sports Centre; the Dolmen Resort Hotel & Spa is a modern seaside complex with a white façade. The hotel has several dining options; Buffet food is served in the bright modern ambience of the Menhir Restaurant, La Sybille offers Mediterranean cuisine with an Italian emphasis and an array of wines in an intimate atmosphere, and if dining alfresco is the order of the day, the Batulaban Restaurant's shaded wooden terrace with panoramic views serves barbecued meats and salads. There is English-pub style bar, and snacks and grilled foods are also served in Café Delos. The hotel has lagoon-style swimming pools with panoramic views. Guests can try their luck in The Oracle Casino which features 12 gaming tables. Guests can relax in the Myoka Spa, with a hydro bath, jetted tubs, sauna, and algae-based beauty treatments. The Sunny Coast Resort Club is located in Qawra, Malta, five metres from the hotel's private beach, and three kilometres from Xemxija Roman Tombs. This resort hotel has shopping on site, as well as a leisure centre with an indoor swimming pool, fitness equipment, a sauna, and spa tubs. Sunny Coast Resort Club has a restaurant on site, which serves Mediterranean dishes that can be eaten inside or by the poolside bar. 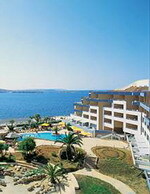 The resort has a private beach on Qawra Bay, which is adjacent to the hotel's outdoor swimming pool. The apartment-style rooms at this modern resort complex all have balconies, and kitchenettes with refrigerators. Other amenities include televisions, air conditioning, direct-dial phones, and safes. Upgrade offer: When booking a one-bedroom apartment with inland view, guests can get a one-bedroom apartment with seaview instead. Sliema (or Tas-Sliema) is a city located on the northeast coast of Malta. It is a centre for shopping, restaurants and café life. 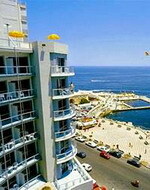 Sliema is also a major commercial and residential area and houses several of Malta's most modern hotels. Sliema, which means 'peace, comfort', was once a quiet fishing village on the peninsula across Marsamxett Harbour from Valletta. Now Sliema and the coastline up to neighbouring St. Julian's constitutes Malta's main coastal resort. Sliema got its name from a chapel dedicated to The Virgin Mary under the title of Star of the Sea, which served as a beacon and a reference point to the few fishermen who lived in that area. The name could thus be connected with the first words of the Hail Mary prayer. Sliem is the Maltese word meaning peace. With a unique atmosphere, special hospitality and convenient facilities, The Diplomat Hotel Sliema offers excellent accommodation that makes you feel at home. 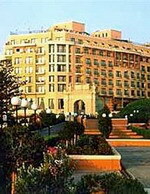 This hotel is positioned on the prestigious Sliema Promenade facing the exhilarating Mediterranean sea. Located in the heart of Maltas business and tourism centre, this property is just a short stroll from Sliema city centre and a drive away from St. Julians as well as La Valletta. All the guestrooms at this hotel are well decorated and equipped with modern amenities that makes your stay a pleasant and comfortable one. Attentive room service for your convenience is also offered here. The onsite restaurants serve delicious food in a fine setting. The pleasant ambience of the bar makes it a perfect place to unwind with a refreshing drink. Business travellers can avail the facilities of the meeting rooms that are equipped with state-of-the art technology. Also available onsite is a gymnasium and a swimming pool, which is an ideal place to rest after a hard day's work. The Fortina Hotel is situated on the waterfront in a quieter part of Sliema, 400 metres from shops and cruise departure points in Sliema harbour. The Fortina overlooks Valletta, the island’s capital city, and offers spectacular sea views. 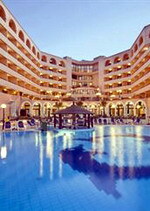 The hotel is also five kilometres from Valletta, Malta's walled capital city. Malta International Airport is eight kilometres away, an approximate driving time of 10 minutes. Onsite facilities include a cocktail bar featuring evening entertainment in the winter, an outdoor bar with stunning views and evening entertainment in the summer, and an indoor garden bar. Hotel restaurants include La Vallette Buffet Restaurant; Tigne Brasserie, serving French and continental cuisine; and Sa Re Ga Ma, serving authentic Indian cuisine. Four additional restaurants are available at the adjoining Fortina Spa Resort. The Preluna Hotel and Spa is a high-rise tower located on the seafront at Sliema, five kilometres from Malta's capital city, Valletta. The hotel's dining facilities vary from formal dining experiences with live show cooking from open kitchens to a wine bar and bistro. Theme dinners are also regularly held, including Maltese, Oriental, Italian and Carvery Cuisine themes. The hotel's many bars include La Piazza lobby bar, the Venus music bar and the Skyroom Penthouse suite, which affords some lofty views of the coast. The hotel has a private seafront lido with a salt-water swimming pool and bar, as well as sunbed facilities. There is also a rooftop garden with jetted tubs . The onsite health spa includes jetted tubs, steam bath, hot tubs, and gym and massage facilities. A range of water sports are available at the hotel's seafront lido, and a nine-hole mini golf course is located on the rooftop. St. Julian's, also known as San Giljan, is a town in Malta situated along the coast, north of the country's capital, Valletta. It is known for tourism-oriented businesses, such as hotels, restaurants and nightclubs, centred mostly in an area known as Paceville. The town is subdivided into informal districts which are Paceville, Ta' Giorni, Tal-GHoqod, St. Andrew's, as well as the regions surrounding St. George's Bay, Spinola Bay, Balluta Bay, and Il-Qaliet cliffs. Saint Julian's is a popular town, usually flowing with tourists, especially during the summer months. It is also a well-sought after destination by the Maltese. The town has only one skyscraper, the 98m tall Portomaso Tower. Corinthia Hotel St. George's Bay overlooks beautiful St George's Bay, just one kilometre from the lively centre of the pretty fishing village of St Julian's bay. 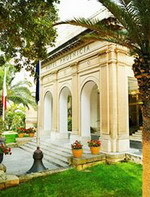 The hotel has two restaurants: spacious Fra Martino Restaurant, cleverly divided into sections with split levels and columns, serving a buffet selection of dishes, including several Maltese specialities; and Il- Frejgatina, a relaxed outdoor restaurant overlooking the sea and serving a wide variety of fresh fish. Guests can swim in five outdoor pools, enjoy a drink and snack from the pool bar, and pamper themselves at the beauty club offering different therapies and health programmes. 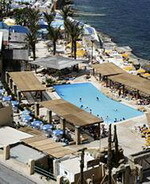 The hotel is three kilometres from the bustling town of Sliema, and eight kilometres from the capital city of Valletta. Malta International Airport is an approximate driving time of 20 minutes, a distance of 12 kilometres (7.5 miles) from the hotel. Built in 1999, the seven-floor Golden Tulip Vivaldi Hotel occupies a seafront location in Malta's fashionable St. Julian's, 100 metres from the beach and seven kilometres from Valletta, Malta's capital city. Energetic guests can work out in the fitness centre and swim in the indoor pool before relaxing in the sauna or steam room, or enjoying a pampering massage. Alternatively, guests can soak up the sun on a sun bed and then cool off with a dip in the outdoor pool before relaxing with a drink in the bar. Antonio's Restaurant has panoramic Mediterranean Sea views, and serves Mediterranean cuisine with theme nights including Maltese, Italian and Arabian. Drinks, snacks and crepes are on offer at the Rhapsody Lounge and Cafeteria, and the hotel has a seasonal poolside bar. Marina Hotel at the Corinthia Beach Resort stands along the Mediterranean Sea in the St. Julian's resort community located on St. Georges Bay in Malta. 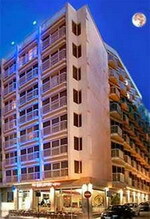 The hotel is positioned near the casino and the pulsating night life of Paceville. This hotel forms a section of the Corinthia Beach Resort that includes a private beach with water-sport activities. Eight on-site restaurants and bars include the Bay View Restaurant. This dining venue serves buffet-style breakfasts and dinners with a menu that includes pastas and international courses. Da Marina features pastas prepared with Italian and Maltese specialty sauces. Vinotheque is known for its continental fare, cheese platters, fine wine selections and pastries. Live bands and a pianist play at the Bay View Lounge. An outdoor saltwater and a freshwater pool provide relief from the penetrating Mediterranean sun. Windsurfing, water-skiing, scuba diving and yacht charters are available on the resort premises. Guests receive complimentary access to the neighboring Apollo Club that houses a fully equipped gymnasium, an indoor pool, a spa tub, a sauna and massage- and beauty-treatment rooms. The modern Radisson Blu Resort, Malta St. Julian's is located on St George's Bay, Malta, 500 metres from the beach and one kilometre from the shops and nightlife of St Julians. Valletta, the capital city, is 10 kilometres from the hotel. 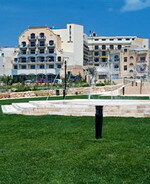 The seven-floor Radisson Blu Resort, Malta St. Julian's has air conditioning in all public areas. The resort provides a courtesy shuttle to a nearby casino each evening. A complimentary buffet breakfast is served in the Kon Tiki Restaurant, which offers a Mediterranean buffet accompanied by live piano music in the evenings. In the summer, there is alfresco dining at The Edge, with sea views and fresh fish dishes. The intimate Le Petillant restaurant specialises in flambeed dishes prepared at the table. Sandwiches and snacks are available on the terrace of Le Bistro, and the swim-up Pool Bar serves drinks in the summer months. The resort has a diving centre and water sports centre, with activities including water skiing, windsurfing and canoeing. There are two tennis courts. The health and beauty centre has an indoor pool, sauna, hot tub and beauty treatments including massages. Valletta contains buildings from the 16th century onwards, built during the rule of the Knights of St. John of Jerusalem (the Knights Hospitaller). The city is essentially Baroque in character, with elements of Mannerist, Neo-Classical and Modern architecture in selected areas, though World War II left major scars on the city. The City of Valletta was officially recognised as a World Heritage Site by UNESCO in 1980. 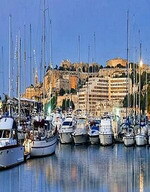 The city is named for Jean Parisot de la Valette, who succeeded in defending the island from an Ottoman invasion in 1565. The official name given by the Order of Saint John was Humilissima Civitas Valletta — The Most Humble City of Valletta, or Città Umilissima in Italian. The bastions, curtains and ravelins along with the beauty of its Baroque palaces, gardens and churches, led the ruling houses of Europe to give the city its nickname Superbissima — 'Most Proud'. Grand Hotel Excelsior is located in Valletta, Malta, within five kilometres of the towns of Sliema and St Julians. The archaeological sites of Vittoriosa, Cospicua, Senglea and Tarxien Temples are within three kilometres. The hotel is set amid 15,000 square metres of landscaped gardens and is surrounded by the 16th-century bastion walls of Valletta. Perched on the edge of the sea, this 10-storey hotel offers an indoor and outdoor swimming pool surrounded by a sundeck with sun beds and umbrellas. 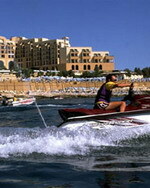 Staff are available at the front desk to organise airport transfers, limousine service and water taxis to Sliema town. There are 5 restaurants and four bars serving international, Mediterranean, Italian and Maltese dishes. The Grand Hotel Excelsior features a spa with sauna, steam bath and beauty and massage treatment rooms. Bicycles are available on site to further explore the town. Golf is available within four kilometres and a casino is located within six kilometres.